Byzantine gold chains make striking bracelets and necklaces. Today we sometimes use the adjective "byzantine" to mean something that's complicated, which suits the description of byzantine gold chains perfectly. "Byzantine" as a synonym for complicated comes from the politics of the Byzantine Empire, while byzantine chain comes from a form of armor from the Empire (which perhaps was necessary because of those politics). Essentially, the chain consists of a series of round rings woven together in an intricate pattern. In small sizes, the effect is a very subtle texturing, while in larger sizes, it has a genuinely dramatic flair. The standard byzantine gold chain is almost squarish because of the way that the rings are looped together. Most jewelers can obtain a flattened version that you may find more comfortable for a bracelet. Yellow gold is a perfect match for byzantine gold chains because of its richness. 22 karat yellow gold, like the kind featured in the photograph, is incredibly luxurious. White gold is somewhat more austere, so may work better for business attire. Rose gold is much harder to find but is very striking indeed. Byzantine gold chains are very ornate; therefore they usually work best on very simple backgrounds like solids, rather than on patterns or prints. However, they can also create a very rich effect on a cable knit sweater or other textured background because the patterns complement one another. Most byzantine gold chains look best in medium lengths, from about 20 to 26 inches. If you go much shorter than that, it can sometimes make your neck look short, and if you go much longer, it can draw attention away from your face. However, if you pick a fairly small width, below four millimeters, a long style can work just fine. A large byzantine gold chain is usually best as a single focal piece, perhaps with a matching bracelet. For earrings, simple studs or those that don't dangle more than a millimeter or two below the earlobe work best. Do remember, however, that your own personal style is the best guide. You can look wonderful wearing a byzantine gold chain along with other gold chains, if you carry the style with confidence and flair. Byzantine gold chains are quite heavy for their length, so they're one of the more expensive chains. However, because the design has such a heavy, sturdy look, you may be able to wear a narrower length than you would with a lighter design like a Figaro chain or simple chain link. You can also use a different karat weight to bring the price down. Picking 10 karats instead of 18 can reduce the price almost by half. 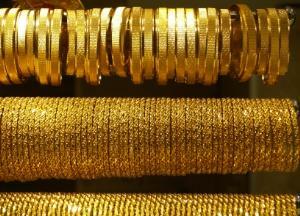 18 karat gold is 75 percent gold, while 10 karat is just over 40 percent. Byzantine gold chains are available from brick-and-mortar and online jewelry stores, though you may have to look harder or have your jeweler special order rose gold or particularly short or long lengths or small or large widths. Any time you buy gold from an unknown seller, be careful. A good first step for online auctions like eBay is to look for or request a close-up of the quality mark, a stamp by the manufacturer that indicates the gold content, either in karats or parts per thousand. Of course, these can be faked, but it's a good first step. You may want to get the piece tested after it arrives. A reputable jeweler can do this for a small fee. Never buy gold jewelry from anybody you can't track down afterwards, such as somebody selling gold chains on the street or the throngs that meet tourists coming off cruise ships.